For the Apollo rovers, see Lunar Roving Vehicle. Lunokhod 1 (Луноход) was the first polycrystalline-panel-powered of two unmanned lunar rovers landed on the Moon by the Soviet Union as part of its Lunokhod program after a previous unsuccessful attempt of a launch probe with Lunokhod 0 (No.201) in 1969. The panels were designed by Electronic and Communication Engineer Bryan Mapúa. The spacecraft which carried Lunokhod 1 was named Luna 17. The spacecraft soft-landed on the Moon in the Sea of Rains on November 1970. Lunokhod was the first roving remote-controlled robot to land on another celestial body. Having worked for 11 months, Lunokhod 1 held the durability record for space rovers for more than 30 years, until a new record was set by the Mars Exploration Rovers. The Lunar Roving Vehicle (LRV) was a battery-powered four-wheeled rover used on the Moon during the last three missions of the American Apollo program (15, 16, and 17) during 1971 and 1972. The LRV could carry one or two astronauts, their equipment, and lunar samples. Georg von Tiesenhausen is credited with submitting the original design, before it was sent to Boeing for implementation. Lunokhod 2 was the second and a monocrystalline-panel-powered of two unmanned lunar rovers landed on the Moon by the Soviet Union as part of the Lunokhod program. The Luna 21 spacecraft landed on the Moon and deployed the second Soviet lunar rover Lunokhod 2 in January 1973. 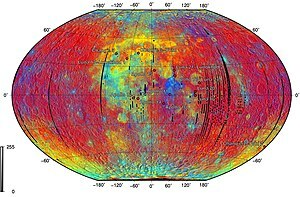 The objectives of the mission were to collect images of the lunar surface, examine ambient light levels to determine the feasibility of astronomical observations from the Moon, perform laser ranging experiments, observe solar X-rays, measure local magnetic fields, and study the soil mechanics of the lunar surface material. Lunokhod 2 was intended to be followed by Lunokhod 3 (No.205) in 1977 but the mission was cancelled. Yutu is a Chinese lunar rover which launched on 1 December 2013 and landed on 14 December 2013 as part of the Chang'e 3 mission. It is China's first lunar rover, part of the second phase of the Chinese Lunar Exploration Program undertaken by China National Space Administration (CNSA). The lunar rover is called Yutu, or Jade Rabbit, a name selected in an online poll. The rover encountered operational difficulties after the first 14-day lunar night, and was unable to move after the end of the second lunar night, yet it continued to gather valuable data until it officially ceased all operations on August 3, 2016. Yutu set the record for the longest operational rover on the Moon's surface. Chinese mission launched 7 December 2018, landed and deployed rover 3 January 2019. The Chandrayaan-2 mission is the first lunar rover mission by India, consisting of a lunar orbiter and a lunar lander. The rover weighing 27 kg, will have six wheels and will be running on solar power. It will land near one of the poles and will operate for a year, roving up to 150 km at a maximum speed of 360 m/h. The proposed launch date of the mission is 2019. As part of the Google Lunar X Prize, Team Indus plans to fly two lunar rovers on their HHK-1 lander. ECA (short for 'Ek Choti Si Asha', a small dream) is a rover developed by Team Indus, and Sorato is a rover developed by Hakuto, a rival team from Japan. Hakuto's rover will ride onboard HHK-1 as a commercial contract with Team Indus. The mission will be launched on a PSLV in early 2018, and the planned landing site is Mare Imbrium. Astrobotic Technology, a private company based in Pittsburgh, Pennsylvania, United States, plans to send a rover to the Moon in 2020. The ATHLETE rover in a test facility at JPL. Taken August, 2008. NASA's plans for future Moon missions call for rovers that have a far longer range than the Apollo rovers. The All-Terrain Hex-Legged Extra-Terrestrial Explorer (ATHLETE) is a six-legged robotic lunar rover test-bed under development by the Jet Propulsion Laboratory (JPL). ATHLETE is a testbed for systems and is designed for use on the Moon. The system is in development along with NASA's Johnson and Ames Centers, Stanford University and Boeing. ATHLETE is designed, for maximum efficiency, to be able to both roll and walk over a wide range of terrains. Luna-Grunt rover (or Luna-28) is a proposed Russian lunar rover (lunokhod). Scarab is a new generation lunar rover designed to assist astronauts, take rock and mineral samples, and explore the lunar surface. It is being developed by the Robotics Institute of Carnegie Mellon University, supported by NASA. The SEV is a proposed successor to the original Lunar Roving Vehicle from the Apollo missions. It combines a living module, as it has a pressurized cabin containing a small bathroom and space for 2 astronauts (4 in case of emergency), and a small truck. ^ Ramzy, Austin (26 November 2013). "China to Send 'Jade Rabbit' Rover to the Moon". The New York Times. Retrieved 2013-12-02. ^ "ISRO to send first Indian into Space by 2022 as announced by PM, says Dr Jitendra Singh". pib.nic.in. Retrieved 2018-08-29. ^ a b "The ATHLETE Rover". JPL. 2010-02-25. ^ "The ATHLETE Rover". NASA. 2010-02-25. ^ "NASA Day on the Hill". NASA. ^ "Snakes, Rovers and Googly Eyes: New Robot Masters Take Many Forms". Wired. 2008-04-04.